So Chris Colose says a few week ago that University of Albany’s professor and senior researcher Dr. Chris Walcek is to give a talk on global warming entitled “More Inconvenient and Convenient Aspects of Global Warming.” All went well, no one threw anything at Chris Walcek, although one irate chap did stand up in the Q&A and yell about the disservice he gave to the audience. That guy was a little strange, but what about Chris Walcek’s presentation?? Additional points raised by Chris Walcek include– Sea level variability is not significant, cooling and ice accumulation in Antarctica interior, CO2 lagged (not led) temperature over the glacial-interglacial cycles, solar correlation to temperature is high over the 20th century, globe is warming but not outside the range of natural variation and within our understanding of the climate system, models not yet sufficient. So far so good. But this graphic was followed up by the term “measly” when comparing anthropogenic to natural emissions. More specifically, natural sources of CO2 are roughly 30x the anthropogenic contribution. Dr. Walcek did follow up with the comment that even eating a snicker bar a day can eventually make someone fat, and that little bit from humans can add up, but I want to pause further to discuss this because if I was not knowledgable of the carbon cycle I would have been left scratching my head. First of all, from a radiative perspective, global temperature changes do not follow emissions…they follow concentrations. How are CO2 concentrations in the atmosphere regulated? The simple answer is that they are regulated by a balance between CO2 sources, as well as sinks which remove it from the atmosphere. This includes interactions between the oceans, biosphere, atmosphere, etc. This interaction can be seen with a good deal of justice in the following diagram. However, the important point is that the pre-industrial natural emissions of CO2 are roughly balanced by what is removed. So, in general, there is minimal *net* change in atmospheric CO2 on the simple basis of how much natural emissions are. To get the observed increase, humans have shifted one side of that equation by emitting far more than the oceans can keep up with. Even if the human emissions are a “measly 7.0 Gt/yr, ” they account for around 100% of the rise in concentrations since pre-industrial time, while being fairly stable for hundreds to thousands of years, and never higher in at least 850,000 years from ice core records (and never rising at today’s rate). The next part of the lecture was one I simply could not understand. That is, why Dr. Walcek even bothered to include it. Dr. Walcek showed a scatter plot of temperatures from Albany, NY, from the 1800’s to the early 1900’s. He then aroused mass curiosity as we waited for the rest of the picture, when fossil fuels start to rise. To our disappointment, or amusement, nothing changed…the same ‘ol flat line to present day. Later in the lecture, Dr. Walcek also presents the audience with a graph from Greenland for comparisons between today to 1930, the Holocene, and the glacial-interglacial cycles. If anything good can be said about the crazy guy in the audience who decided to stand up and yell (that both Chris Colose and Chris Walcek wanted to throw something at), it was the term “cherry-picking” that I agreed with. We start with Greenland in the 1930’s. Let’s go to GISS and see a run of annual temperature anomalies from 1995-2007 relative to 1930-1940. As we see, definitely a bit cooler now in Greenland. Now there is a good deal of uncertainty in this. More specifically, a lot of the older stations were mostly southern, mostly coastal so we cannot now say with high confidence which decade was warmer, but they are undeniably on the same order of magnitude. A lot of the earlier warming in Greenland appears to be some solar, lack-of-volcanic, the Atlantic Meridional Oscillation, and some Black Carbon (McConnell et al., 2007; Science). In particular, the NAO (which measures the strength of the westerlies across the North Atlantic) likes to redistribute heat around, and was in a phase in the early century that favored high latitude warming. This was NOT a trend throughout the globe. Over the mid-Holocene, the high latitudes were clearly a bit warmer than they were today, due to more summer sunlight from orbital forcing. The Greenland retreat then was also on orders of kilometers less than the current position, and the ice responded. Greenland really does not care who changes it, but the fact is that when it warms it will respond. The global signal, and timescales of consideration, as well as lack of previous causes operating now, makes today’s warming more unique. Greenland and Albany are both large (one a wee bit larger than the other), but neither of them are the globe. Global warming, so far, is nearly 1 degree centigrade. That is very large compared to decadal-average, global-average variability. But, it is not large compared to variability over shorter times and smaller areas, so it is virtually guaranteed that there are still places that are not (yet) anomalously warm, or record warm, or what have you. 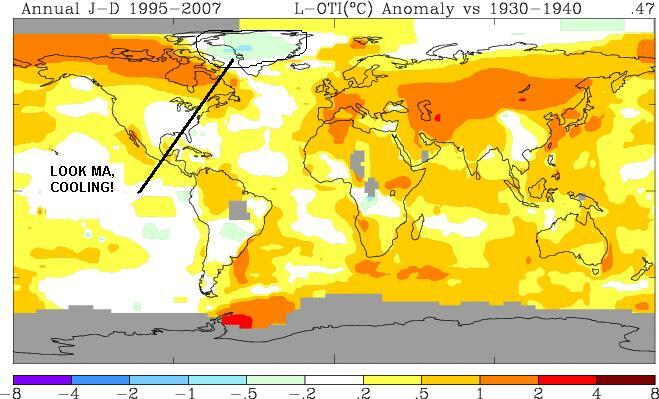 Unfortunately, what was not done is to epmhasize the the significance of the global mean anomaly. In fact, if you lower the pre-industrial global temperatures by just, say, 4-6 C then you can sufficiently get an ice age going. If you lower Albany’s temperature by 4 C, it will be noticeable, but not very significant. The smaller the area and/or shorter the interval, the larger the variability. Regional Climate info is found in detail in chapter 11 in the IPCC AR4 report. As the IPCC goes over, regional variability may/may not be indicative of the global average, and may be much larger or smaller. 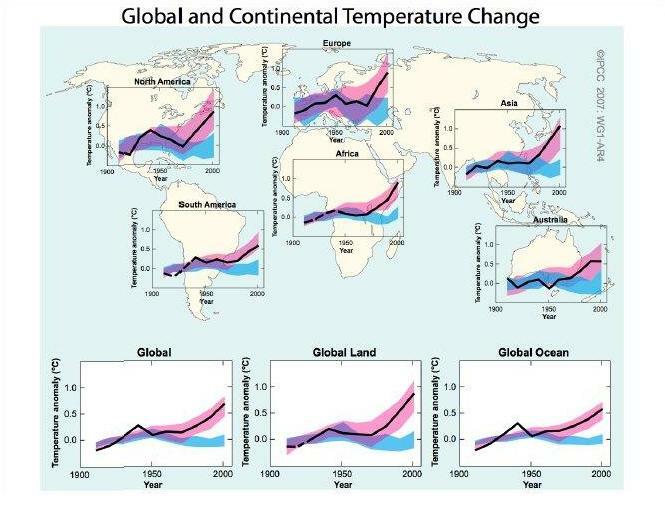 Because of changes in urbanization, topography, redistribution of heat via atmospheric circulation, uneven solar radiation, aerosols, location near a mountain or the ocean, changes on very small spatial scales are a very poor indicator of climate change on the global scale, and lead to misleading impressions about the scale over the global average. Is the human-induced signal discernable from natural variation? Dr. Walcek then treated the method of the analysis, namely the fact it is model-based. It is going to take a lot ot convince me that they areoff so much on global and century scales, but I want to simply reinforce the notion here that the evidence for CO2 is not purely model based. The idea CO2 can lead to warm is based on century-old radiative physics, and can be predicted even in the absence of fancy GCM’s (ask Arrhenius what kind of model he was using back in 1896). 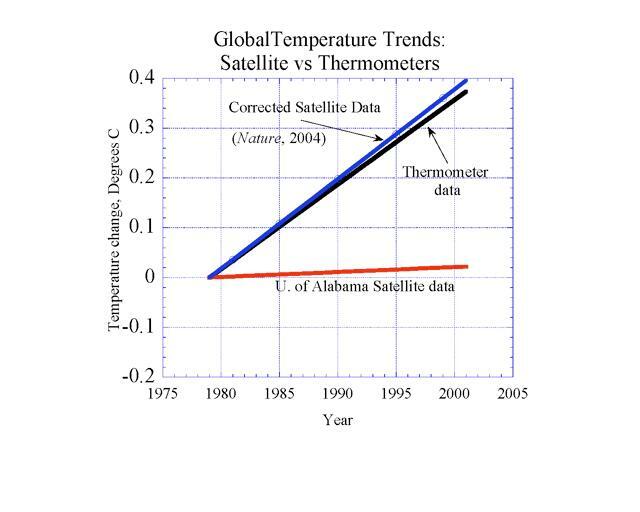 Further, a number of detection and attribution studies have clearly showed “greenhouse fingerprints” associated with an enhanced greenhouse effect, such as stratospheric cooling, the fact heat is going in the ocean not going out, lack of solar and cosmic ray trends over the last half a century, increased downward longwave radiation, etc. Other model-based studies simulate the decadal trends with anthropogenic forcings, but not solely natural variation (See here, here, and here). The IPCC (which Dr. Walcek supports), said back in the 2001 report that a clear, discernable human influence exists and these confidence levels were raised in the 2007 report. It is “very unlikely” that the 20th-century warming can be explained by natural causes (AR4 FAQ 9.2). I happened to meet a lovely young lady there who was mad at meany Chris Colose for my last blog post on this (I walk the Line), but nonetheless we did converse, and she did bring up the good point about the necessity to bring out these issues and get the science right. I agree. But, the first step to this point is to get the claims and each sides positions right so that intelligent dialogue can follow. For example, no one seriously claims that global warming (or anthropogenic global warming) means that every region must get warmer. Winds and ocean circulation can have just as large an impact locally as the radiative forcing from the accumulation of well-mixed greenhouse gases. Nevertheless, throughout this lecture, I found numerous references to the “models say this…observations say this” claims. I would be wary, because most of the time these include claims which are attacking phantom models, or are simply not up-to-date with the current understanding. One point in the lecture for instance is that the models are showing significant Antarctic Warming while observations show cooling. As Spencer Weart shows here, this is simply not true. There are many reasons to expect the Antarctic to not change significantly (now), which include ozone depletion and circulation trends on the regional level, and here is just one model that is not a shortcoming. As readers can see from NASA’s page, there is a good deal of warming over the globe, but not in East Antarctica (West Antarctica has warmed considerably faster). For an array of peer-reviewed reference to the regional variability surrounding the Antarctic which has helped shield it from substantial warming, see Bertler et al., 2004 , Thompson and Solomon, 2002. Dr. Walcek also made the claim that models do not simulate ice ages. Even simple conceptual models on the basis of orbital forcing, and ice-albedo and ocean chemistry feedbacks provide great predictive power for the cycling between glacial-interglacial variations. Didier Paillard (Nature, 1998) can reproduce those from the Milankovich forcing as a simple threshold process. A cycle ends abruptly with a termination, when insolation increases above a threshold value that causes the ice sheet to become unstable and melt rapidly. If insolation stays below a threshold for extended time, a mild glacial to full glacial transition will occur. Ganopolski and Rahmstorf, (Phys. Rev. Let. 2002) have modelled D-O events from a simple threshold processes and stochastic resonance (i.e. a system that resonates is one where some low frequency is slowly amplified until it dominates the system. The key parameters are the level of the threshold, the periodicity of the cycle, and positive feedback). Solar variability cannot account for temperature trends over the last half a century, but explain a good amount from about 1900-1950 (Benestad 2005; Foukal et al., 2006; Ammann et al 2007; Lockwood and Frohlich 2007). Satellite observations and solar proxies show no secular trend since around 1950, and independent signatures that should be associated with increased solar irradiance are not there (stratospheric cooling, decrease in the diurnal temperature range). Chris Walcek displayed a graph on solar-temperature correlation, but it ended around 1980 (I caught that one), but any analysis will show the two signals go off in opposite directions after that. 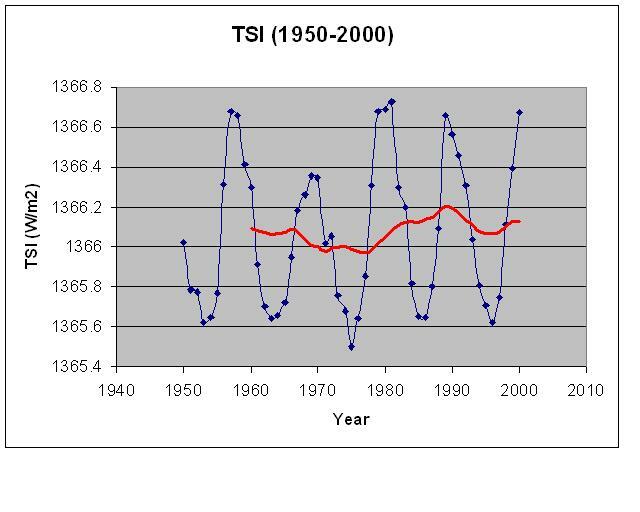 Here is TSI from Lean 2000 over the last 50 years, with an 11-year running average for the solar cycle. When quantified in terms of radiative forcing, the effects are negligible over recent decades. I’m not impressed by lines going up and down. An interesting claim by Dr. Walcek was the discrepanacy between tropospheric temperature changes and models (in the vertical), with models showing warming, and observations showing cooling. This one did not err on models, but rather observations. In fact, all observations do now show warming, and more than the surface because of principles of moist convection. An older satellite data set used by John Christy and Roy Spencer did show discrepancies, but that was corrected by later work, notably here, here, and here. For further confirmation of the most recent satellite developments, Vinnikov et al and the report from U.S Climate Change 2006 Science Program: Temperature Trends in the Lower Atmosphere: Steps for Understanding and Reconciling Differences unequivocally show surface and tropospheric warming, and stratospheric cooling which is consistent with the radiatve effects of greenhouse gases, and temperature changes in an atmosphere following the moist adiabatic lapse rate. I will end on this note, but Chris Walcek describes the role of CO2 in the atmosphere, and compares it to the overwhelming amount of water vapor. I thought this was very misleading, for reasons that I give starting with “water vapor feedback” in this post (half way in, bold type). Ultimately, the water vapor in our atmosphere is controlled by temperature. CO2 makes up a larger chunk of the greenhouse effect than suggested (i.e., removing it all will sufficiently freeze the Earth over to an ice age), and with that you also lose a lot of water vapor (i.e., water condenses out as the saturation vapor pressure follows temperature strongly), so removing all CO2 will close in to a case with no atmosphere. For a doubling of carbon dioxide, Chris Walcek cited an increase of 4 W/m2 when compared to the 492 W/m2 of solar + IR radiation that hits the surface. This number is a radiative forcing, and the argument needs to be completed by how feedbacks will respond, and temperature response. This was not a proper comparison. I have left room for more– like what we can do about it, sea levels, hockey sticks (ughh…); there was also discussion on hurricane trends, etc. As a summary, over the last few decades there has been overwhelming predictive and explanatory power from a greenhouse gas paradigm, with negligible natural changes over the last several decades. Much work needs to be done in modelling the system, but there is no example of a simulation of the coupled ocean-atmosphere-sea ice system that immediately generates a change such as that of doubling CO2 in a Holocene-like environment. Observations and understanding must be improved, but “controversy” over the basics like “does CO2 cause warming” has ended in the primary literature. I am glad Dr. Walcek decided to give a lecture at my school, and welcome him to converse on this. I believe this is a very fair critique of the lecture. There were some inaccuracies (>> troposphere cooling, solar correlation) but for the most part it was good evidence but strange interpretation. For example, the graph on Antarctic ice growth came from the paper in Science by Curt H. Davis and colleagues, which specifically note the accumulation is due to more precipitation (which is a prediction of global warming!!). Albany trends are off topic. I think the silliest one was the sea level rise stuff, especially as he showed daily tides. …incredible. Good work chris. I have a question about the stories of the recent Arctic cooling over the past January. What is going on? Hey Chris, I’m glad that you did follow up in a much more unbiased fashion. I respect the research you’ve done and the effort you put into everything. We all have a right to our opinions, which I believe we should form after we hear all sides of a story. The general population has been bombarded by the Al Gore school of though with minimal to no contest… and from a purely logical perspective, that doesn’t promote an intellectual approach to the topic at hand. By saying that Dr. Walcek has “cherry picked” his data, you are implying that he is manipulating his audience. This is VERY untrue. His information may seem to have been cherry picked because what has been portrayed to the masses was cherry picked from the very start, and Dr. Walcek was simply filling in the gaps. For an audience member to flat out say that Dr. Walcek has done a disservice to the people was quite ludicrous, and I’m very glad that you agree. The only way to rationally approach ANY topic (global warming included) is to view it from all sides. Explore the viewpoints of others, dissect it, and determine what you believe to be credible. There will always be one study proving something and another one disproving that very same fact. We can all do whatever research we want, but climate studies are still so uncertain, that all we can go on is past data and attempt to use patterns to predict the future. I don’t want to say that either side of the argument is right, however I do want to point out that Dr. Walcek was not trying to convert anyone to his way of thinking. He was simply showing the public what they haven’t been shown, which I feel shows that he has a great deal of respect for the audience. He trusts that each person in attendance will take in what he said and analyze it for themselves. A comment by another skeptic of Dr. Walcek’s on your “I Walk the Line” post insinuated that a community college wasn’t the appropriate audience for such a lecture, and I have to highly disagree. No one was forced to attend and the majority of those who did attend had previous knowledge and were curious of another opinion. Sure, some were completely new to the global warming debate, but this lecture has at least gotten them curious. Dr. Walcek sees that HVCC students are just as capable of academic work and understanding scientific research as any student at a private 4 year university would be. This is what makes Dr. Walcek respectable. Each and every person has the right to have access to all aspects of an argument, and Dr. Walcek was simply a facilitator. In your opening paragraph– that is a better side of skepticism than I’m used to seeing. “There will always be one study proving something and another one disproving that very same fact.” Sorry, LYL, this and similar remarks by you simply are not intellectually respectable. You are not entitled to your own facts, especially in a scientific context. Chris, scientists like Walcek have a responsibility to make sure that they don’t feed the public information that is simply false. From your description of his errors, it sounds as if part of the problem was that he went with a bunch of half-remembered material from years ago and didn’t have enough respect for his audience to bring himself up to date before giving the lecture. In that sense, it was the lecturer and not the audience that was inappropriate. Science is not about a bunch of people’s opinions, so I agree with Steve in this regard. I’m not sure why people treat global warming or evolution or other “controversial” topics any different than cell theory or the physics of gravity. If you go the academic literature, this “controversy” is not found, but scientists are now addressing technical details that most people dont really care about. However, LYL is right in that people need to educate themselves, primarily for the purpose of being able to sseparate facts and fiction. Dr. Walcek only used published scientific research. I don’t really see how you can dispute that. I personally haven’t checked up on all of Chris Colose’s analysis, but I’m sure with a careful eye, I, or any other educated person, might be able to find discrepancies. I’m not implying that they are there, but its a possibility. I am very for reducing our CO2 emissions and burning less fossil fuels, mainly because it will clean up our air supply, thus positively impacting the rest of our environment. Our CO2 emissions have clearly had a correlation with global warming, but its such a minimal rate compared to what the earth was going to do any way, that I’m just going to do what I can to make our environment cleaner. As another audience member, I think this analysis was fair. If you believe the summary of the lecture was fair, then certain points in the lecture probably cannot be defended. The idea that it was “published research” is not enough, because you need to put in proper context. Lovely Young Lady, as an example of what I mean, if you look at Chris’ figure 3 you will see a good correlation between CO2 and temperature over the ice age cycles (or glacial-interglacial cycles). Now Dr. Walcek mentioned this in his talk, saying that with a careful inspection, CO2 comes after the temperature rise. Dr. Walcek did not take the argument this far (which is good), but it often reads something like “if CO2 came second, you disproved that it forces temperature to rise.” If you have not been introduced to this “debate” much, it is a fairly standard objection that you’ll find all across the internet and blogs. 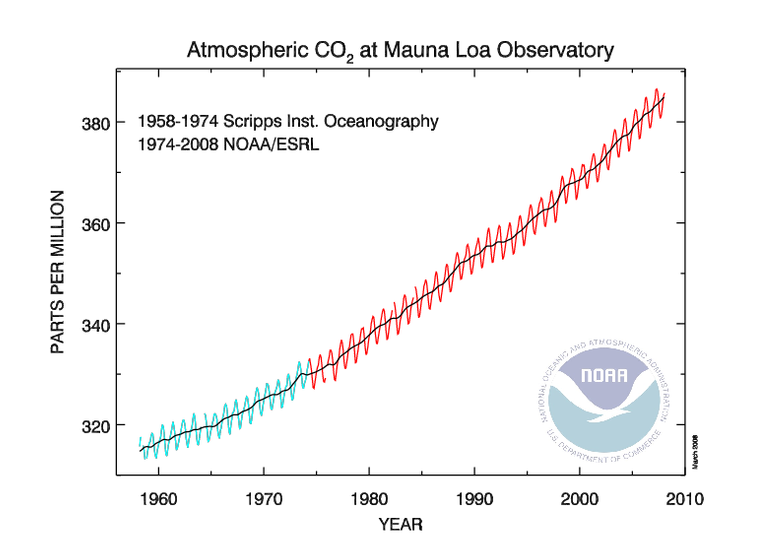 Is the fact CO2 came after temperature published in the mainstream literature? Absolutely, I can think of several papers offhand. In most internet venues, the argument ends right there. But it’s published in the “real” literature, so nothing wrong with it right? Well, an even closer inspection reveals that while CO2 came after temperature, it also provided a positive feedback which further amplified the temperature rise. A good deal of the warming can be explained by carbon dioxide, probably most of it. Just not the first little bit. This was a minor point, and it was not taken to any extreme like “if CO2 came second before, it can’t be coming first now.” However, that is an example of how someone can take “published research” and twist it on its head. From a purely physics stance, adding CO2 has to cause the temperature to rise to satisfy energy balance relationships. The only way it won’t is if that is offset by something else like moving the planet farther from the sun. There actually happens to be some strong cooling effects today, but the greenhouse gas component happens to be stronger than those so the *net* effect has been to warm (those cooling effects are also projected to decline, so that might not be good). At this point, is where the worries come in. What is worrysome is that your statement “but its such a minimal rate compared to what the earth was going to do any way” is not true. The problem is that the trend is rising very fast beyond the noise of natural variation, and so is carbon dioxide. Another ice age is expected several tens of thousands of years from now if you follow the orbital cycle, so for any timescale relevant to us, there is not a reason to expect us to go off course by a degree, degree and a half, in either direction. Noticable climate changes in the past are measured in thousands to millions of years, and that is because the natural changes like shifts in the orbit or plate tectonics take that long. Some exceptions would be like when an asteroid hits. But we’re now getting fairly large changes in decades. The best estimates of a doubling of carbon dioxide in the atmosphere put us back in a climate we’ve not seen for at least several million years. It is also a scenario where arctic sea ice and the amazon are nearly gone. The best estmates if humanity does not reduce emissions is that we’ll get to this mark before the end of this century. We take a stable climate for granted, but the records from the past indicate that for the most part this state of affairs has not been the case. The point is not to be alarmist, but to show that the records from the past and the best models show that staying on track will make his “Standard of living” increase start to plummet with time. Chris, you’re the best, keep up the great work you do, please!